Over the past several years, members of our parish and school have come together to achieve the goal of Gathering and Growing as ONE. One in Faith, Education and Community. Through multiple committees and countless hours, our volunteers and staff have worked on the mission to consolidate our church cluster at Port Washington and Saukville and subsequently guided the incorporation of our Parish and school as St. John XXIII in July of 2016. Through successful fundraising campaigns such as the roof replacement at St. Mary’s and the current Gather & Grow capital fund appeal, major steps have been taken to ensure the future of our Parish and Catholic education for generations to come. 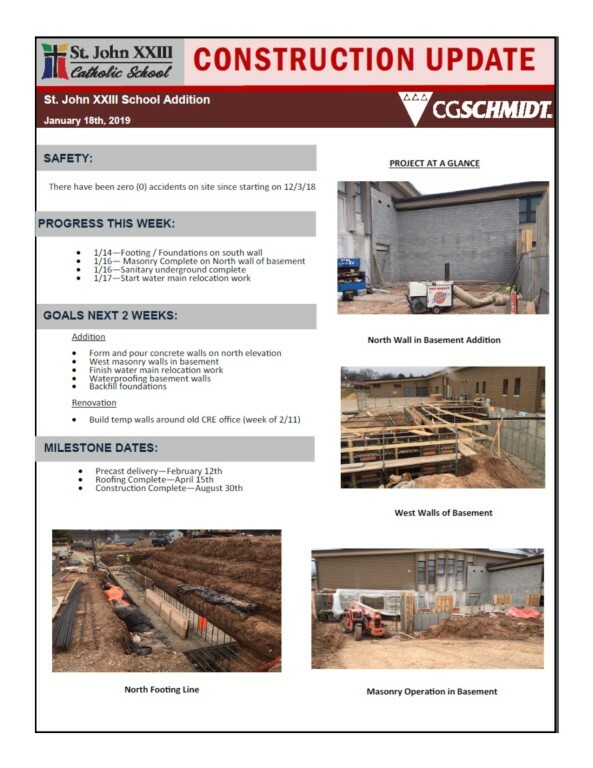 As an update to the building project, we have completed the required changes to ensure a safe and secure environment for all who use the new facilities at the St. Peter’s campus. These were made with support and guidance of the Archdiocese of Milwaukee, Port Washington Police Department and our insurance carrier. 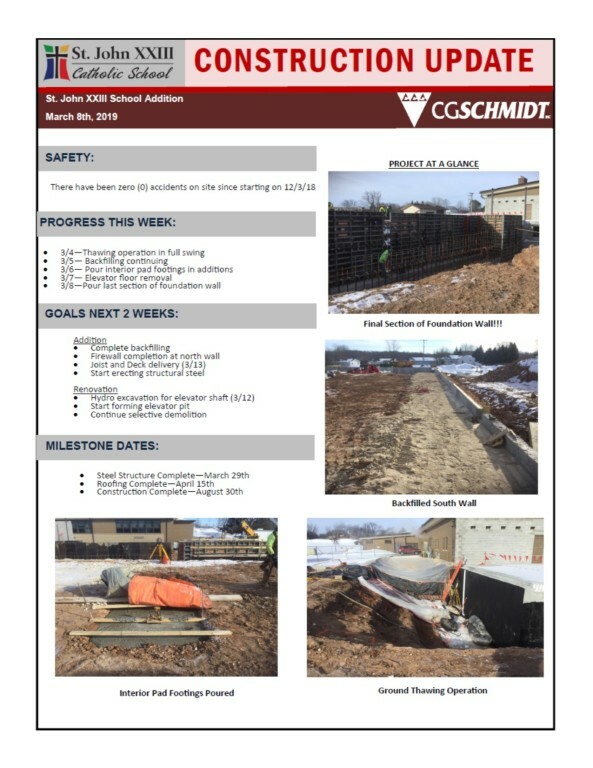 As stated in a previous correspondence, these modifications have resulted in additional structural design costs to the overall project and a delay to the originally planned construction timeline. 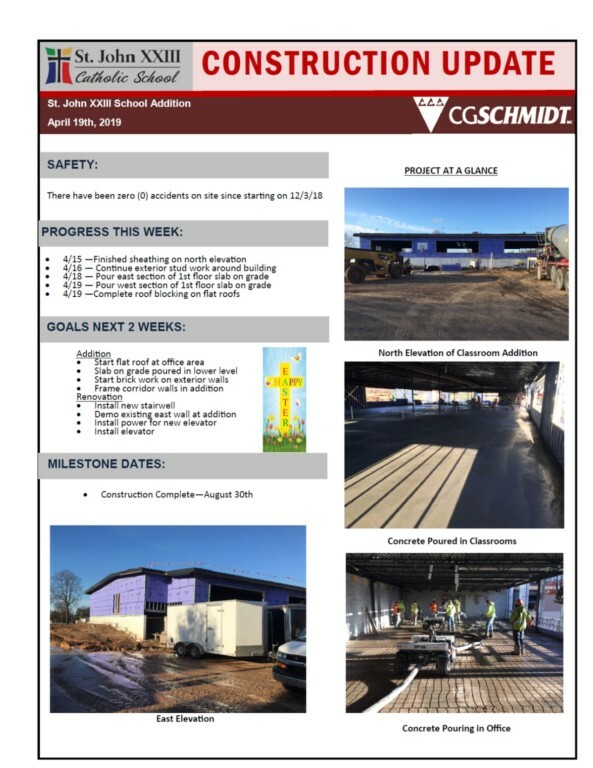 As we approach the last phase before beginning the project, we are preparing the required financial information to submit to the Archdiocese for final approval in mid-November. We are confident that we will be sharing good news of an official project start date with you in the very near future! We are now in the second year of our three year Gather & Grow capital fund appeal and are greatly appreciative of the overwhelming generosity that has been shown by so many. We ask you to continue to fulfill outstanding pledges until your balance reaches $0. 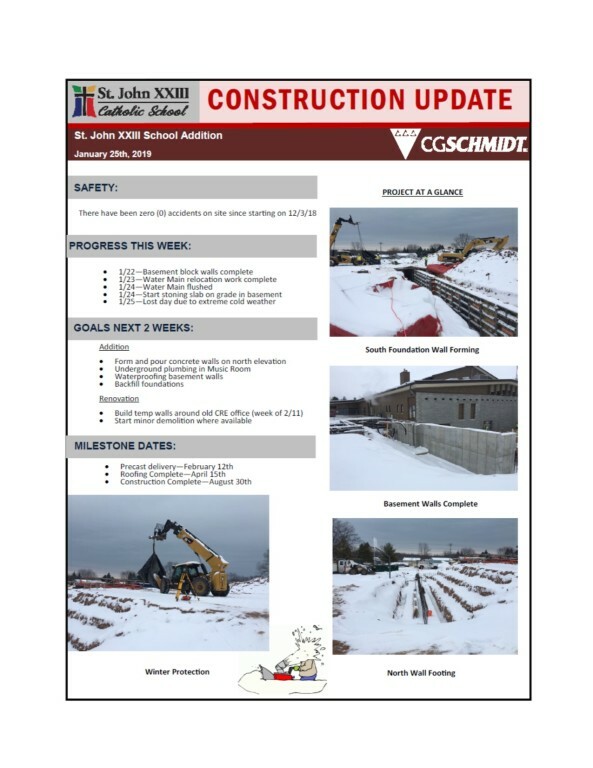 If you are a new member of St. John XXIII parish or school or have been unable to contribute or made a onetime donation during our initial fundraising period, please consider making a pledge or an additional pledge during this very important and exciting time in the history of our Parish and school! 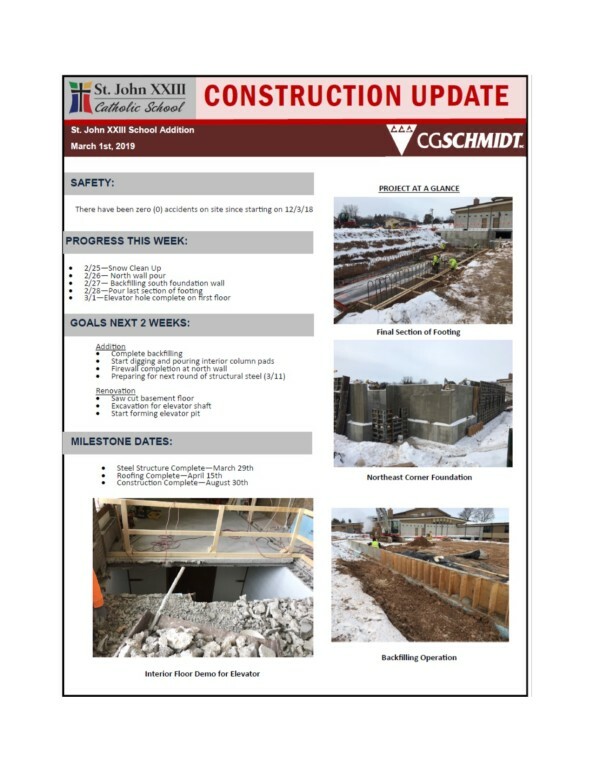 For additional information, please contact Mike Burch at the parish office at 262-284-4266. Since our Gather & Grow capital fund appeal began in September of last year, we are extremely pleased with the generous contributions that have helped us reach our fundraising benchmarks. While the capital campaign has been highly successful, our building plan has been met with challenges. Heightened concern over optimal security and safety in schools and places of worship in our country has resulted in the need to modify our building plans at the St. Peter’s site. With the recent catastrophic events in Florida, Texas and other schools and churches, there is no question as to why this is a paramount issue in our country today. There have been 22 incidences in the U.S. where someone has been hurt in schools or churches since the beginning of the year. 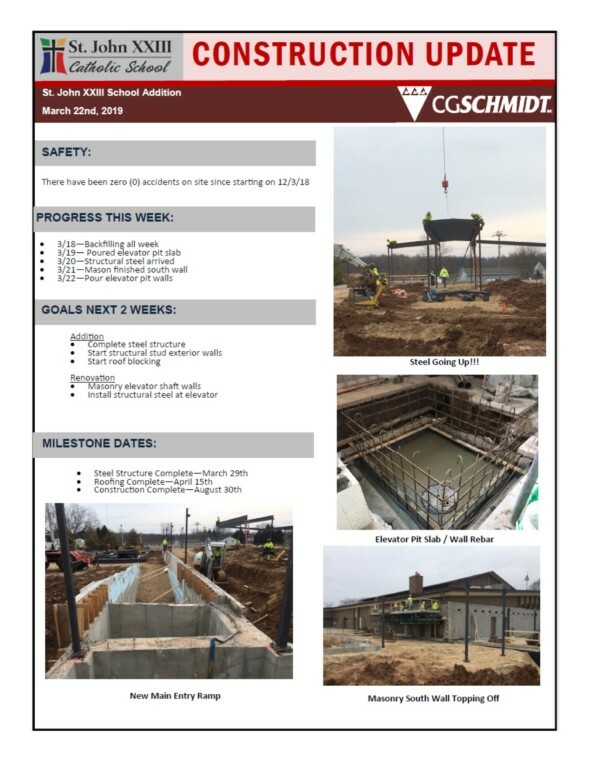 To address this significant issue, parish leadership is working diligently with the Archdiocese of Milwaukee, the Port Washington Police Department and our insurance carrier, Catholic Mutual on modification of architectural plans to optimize safety and security for our students and parishioners in the new structure. 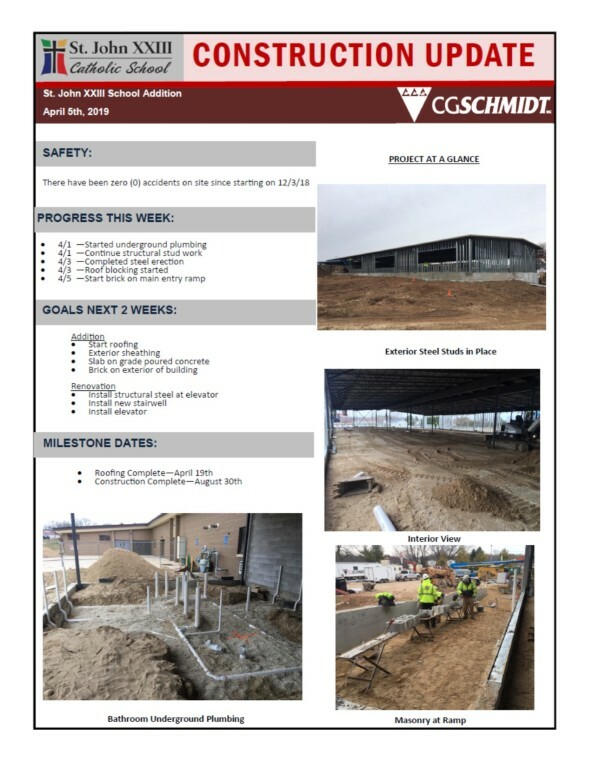 Because of modification to the plans, additional structural design and maintenance costs over and above the original fundraising plan will occur. 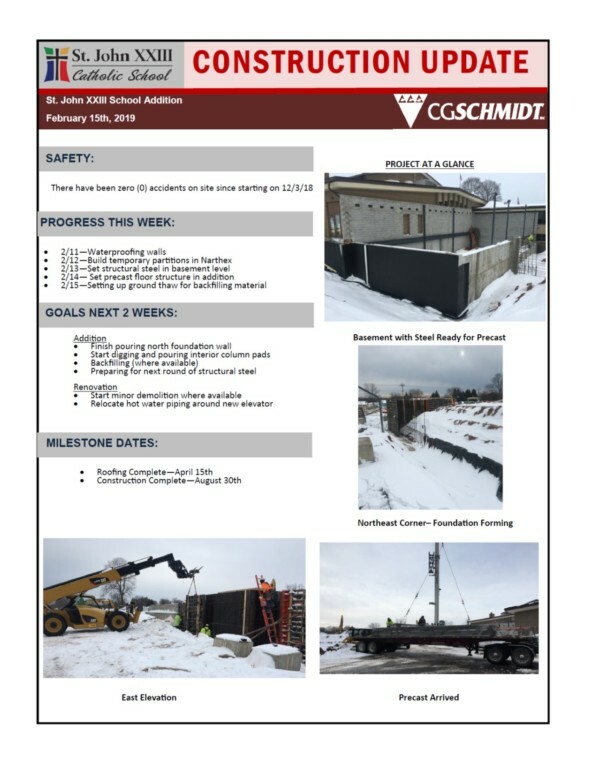 Relocation of classrooms, enhanced alarm and public-address systems and other changes to the new and existing structure are drivers for the increased cost. 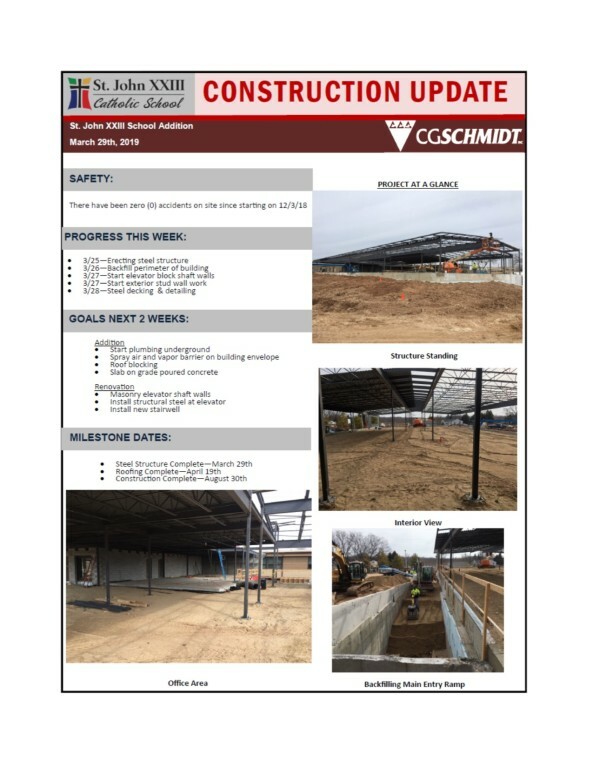 The main driver of increased cost are classrooms originally slated for the West wing have been moved to the new addition to consolidate the school into one secure area. This resulted in additional square footage. 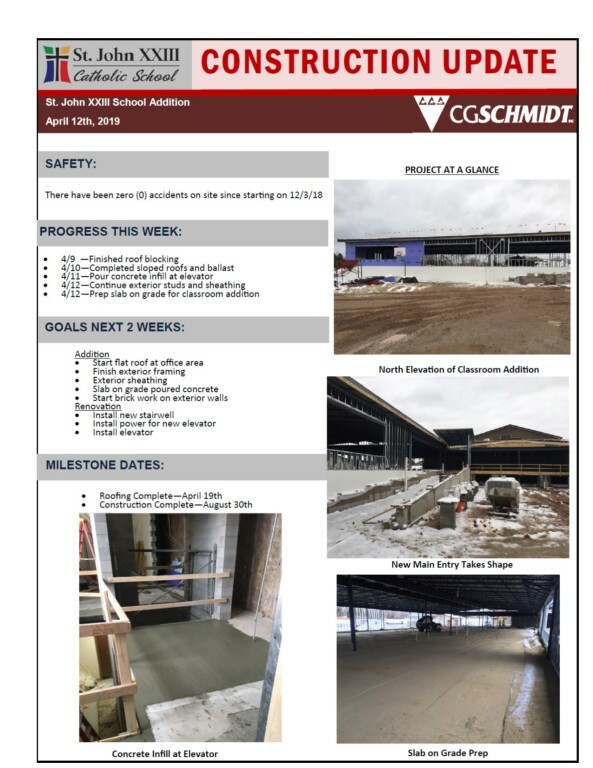 With that said, we are committed to taking the necessary steps to provide a very safe and secure environment for all who will benefit from the new school and parish facility. 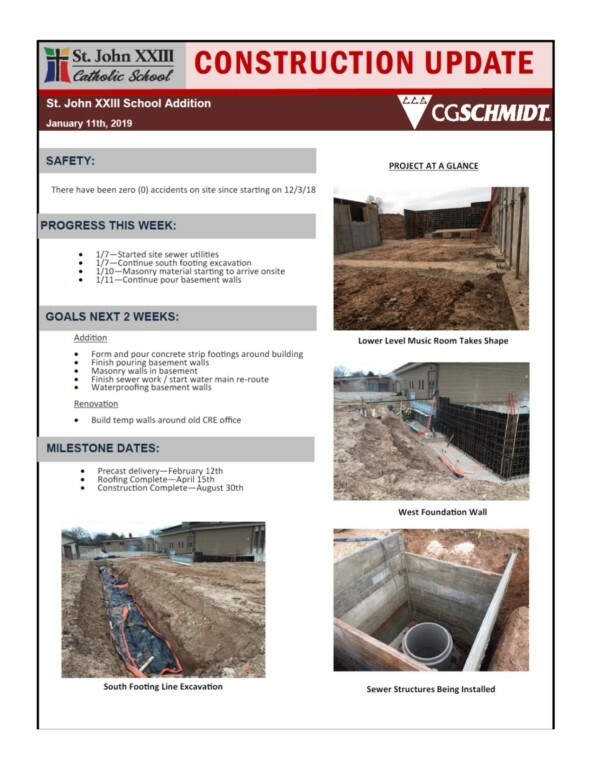 Now, our St. John XXIII Building Committee is working with the architects on the final architectural plan and latest cost estimates in preparation for Archdiocese approval in October. To keep the project on track, we ask that you continue to fulfill any outstanding campaign pledges until the balance reaches $0. If you were unable to contribute during the initial fundraising period or made a onetime donation, please consider making a pledge or an additional pledge at this crucial time of our campaign. 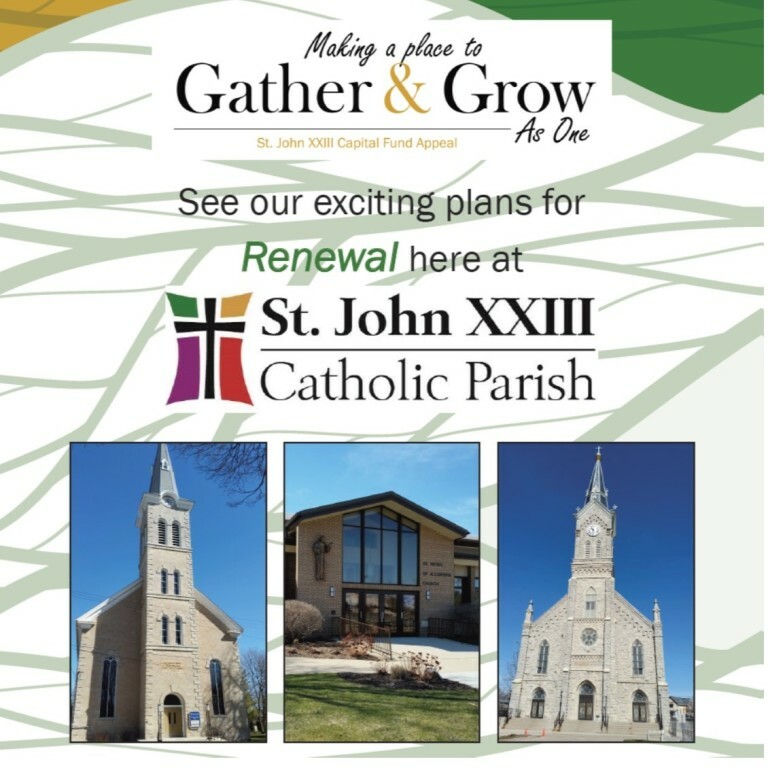 If you are new to St. John XXIII parish or school you will soon receive information on the Gather & Grow fund appeal. For questions or more information on how you can contribute, please contact Mike Burch in the parish office at 262-284-4266. Our goal to gather and grow as one in faith, education and community is moving closer to becoming a reality! We greatly appreciate the recent outpouring of generosity in support of the St. John XXIII Gather & Grow Capital Fund Appeal and ask for your prayerful consideration to continue and/or extend your financial support at this very important and exciting time in the history of our parish and school! Look for more details of final building plans and project timing soon. Here are a couple of things that are happening and we want you to know. We are very close to finalizing the parking at St. Mary’s; there will likely be less parking but we are working with the city and Ansay to maximize available parking in close proximity to the church. To keep the contract viable we have extended the due diligence period to the end of May. We received and accepted an offer to purchase the Immaculate Conception School and Parish House. The purchase price is $240,000 and the due diligence period is until the end of March. 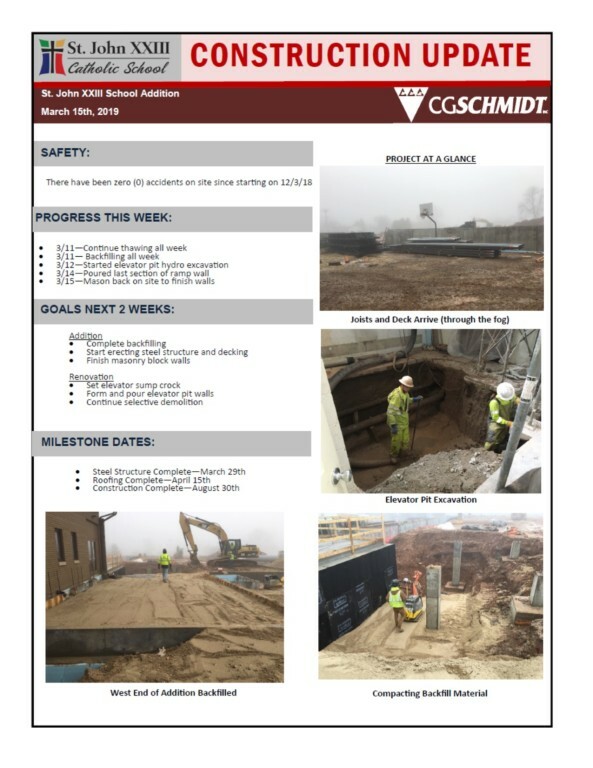 We are looking into modifications to the renderings presented last fall that will ensure optimal student safety. 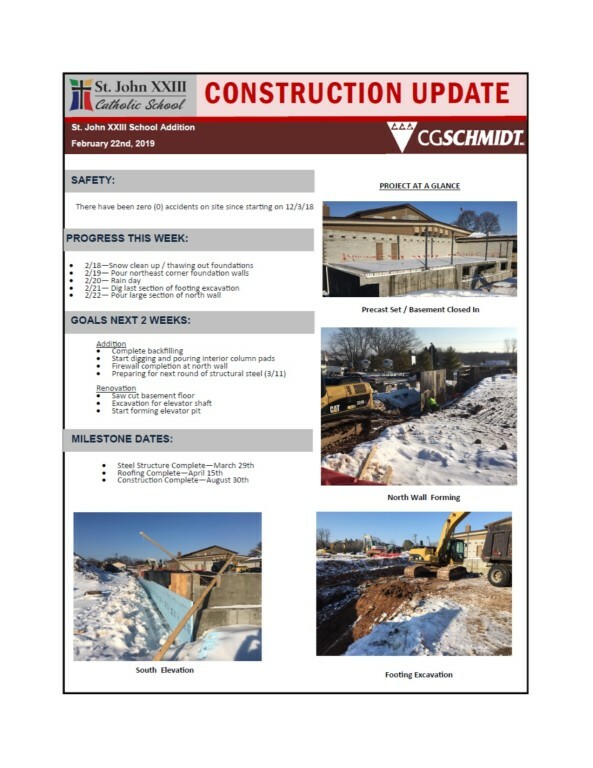 We are working with our architects, the construction manager, our insurance company, the police department and the school & parish staff. Currently we don’t know the implications but you will be updated in the near future. We have selected C G Schmidt for Construction Management. In this pre-construction phase they will be working with PRA (our architects) and our stake holders to finalize plans, bids, etc for presentation to the Archdiocese. We were aiming for August, but because of the security review it may slip to the next one in October. Continue to check back here for more updates. We are blessed by the response of the parishioners to our Gather & Grow Appeal. To all who have responded, a most heartfelt THANK YOU! So far, we have cash & pledges for our capital fund totaling $3,292,889.85. We have also been receiving Annual Stewardship pledges in support of our ministries for 2018.
capital fund totaling $3,021,276.92. We have also been receiving Annual Stewardship pledges in support of our ministries for 2018. We are now looking to have all of the response forms returned. On the response form, you are asked to make both your annual stewardship commitment in support of our parish ministries for 2018, as well as your 3-year financial commitment in support of the building renovation project. If you have not returned your response form, please mail your form to the parish office or bring it to Mass next weekend. If you need a new response form, please contact Deacon Mike Burch in our parish office at (262) 284-4266 or email Mike at burchm@stjohn23rd.org. We are excited by the number of parishioners who responded to our Gather &amp; Grow Appeal last weekend. Toall who have responded, a most heartfelt THANK YOU! We are now looking to have all of the response forms returned. If you have not returned your response form, please mail your form to the parish office or bring it to Mass next weekend. If you need a new response form, please contact Deacon Mike Burch in our parish office at (262) 284-4266 or email Mike at burchm@stjohn23rd.org. Commitment Weekend is here! We have spent the last several months planning, sharing, and praying for the success of our Gather & Grow Appeal. Thanks be to God for the many blessings we have received and the willingness of our parishioners to respond generously with their prayers, time and financial support. If you do not have your response form with you, please mail your form to the parish office or bring it to Mass next weekend. Parishioners have the option of making their Capital Fund contributions using our online WeShare giving option. You can easily access this option by going to our parish website at https://stjohn23rd.weshareonline.org/ You are given the option to setup a recurring gift or a one-time gift. If you intend to make your 3-year campaign donations through this WeShare giving option, you are reminded to setup your recurring Capital Fund gift now if you have not yet done so. Thank you! Now is the Time! This is a special moment in the history of our parish. 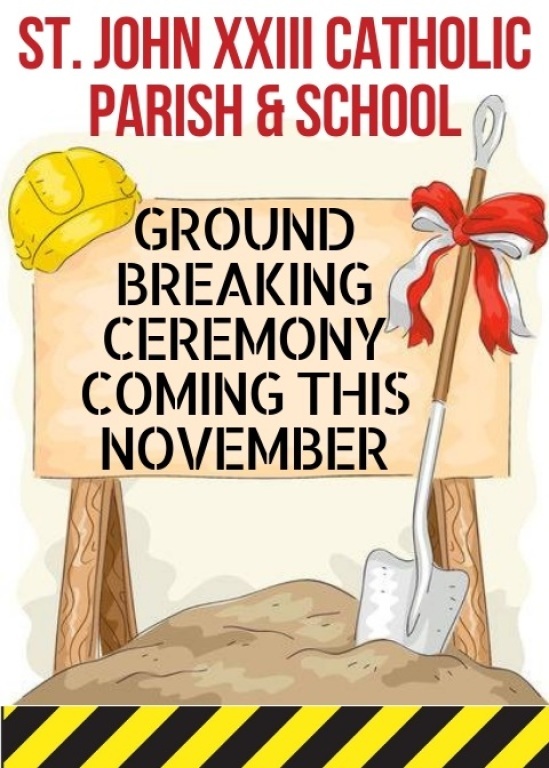 Now is the time for each parishioner to seize this rare opportunity to significantly impact the future of our parish. Now is the time to respond with your financial commitment to our Gather & Grow Appeal. Your response will ensure that our parish is a center of spiritual growth and renewal for generations to come. Next weekend is Commitment Weekend. Please bring your Appeal response form to Mass. If you cannot be with us next weekend, please mail your form to the parish office or bring it to Mass the following weekend. You may be asking: "What should I consider giving so we can achieve our parish goals?" The information you received in your Appeal packet offers you giving options to consider. The gifts we are asking our members to consider are challenging. For many of us, our giving to this Appeal will cause us to reevaluate our priorities. We are challenged to grow in our faith and generosity. We ask everyone to prayerfully respond to God’s abundant grace and love with your generous gifts. Here are the ways you can return your Gather & Grow response form. Thank you! Place your response form in the return envelope found in your appeal packet, and return/mail the envelope to the parish office prior to November 4. Or place your response form in the return envelope and bring it to mass on Commitment Weekend, November 4 & 5, where we will receive all Gather & Grow Appeal responses in a special way. This is the weekend we are sharing more about our Gather & Grow Appeal at all our Masses. By now everyone should have received their Appeal packet in the mail. If you do not have your Appeal packet, please contact Deacon Mike Burch in our parish office at (262) 284-4266 or email Mike at burchm@stjohn23rd.org. This is one Appeal… with two commitments. First, you are asked to renew your commitment of time, talent, and treasure in support of our ministries and parish operations. Keeping our regular giving strong allows us to keep touching hearts and lives with Christ’s love through our many ministries. Second, you are asked to make a three-year commitment to the Capital Fund in support of our proposed renovation plans. Between now and November 5 please prayerfully consider how God is leading you to respond to this Appeal. All parishioners are asked to bring their Appeal response form to Mass on Commitment Weekend, November 4 & 5. If you prefer, you may return your Appeal response form to the parish office prior to November 5. Your response will help ensure that our parish is a center of spiritual growth and renewal for generations to come throughout Port Washington and Saukville. Ultimately, your gift is a gift to God. It is a gift of love in response to all the ways in which God has blessed you. 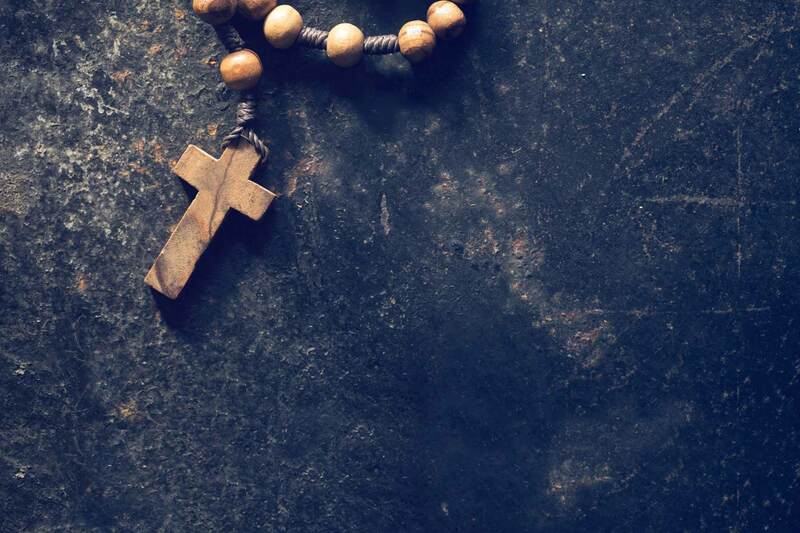 Ask yourself, “What do you treasure about our Catholic Faith and our parish faith community?” and then prayerfully consider how God is leading you to respond. We are grateful for the many parishioners who have stepped up to help in a variety of roles to help make our Gather & Grow Appeal successful. 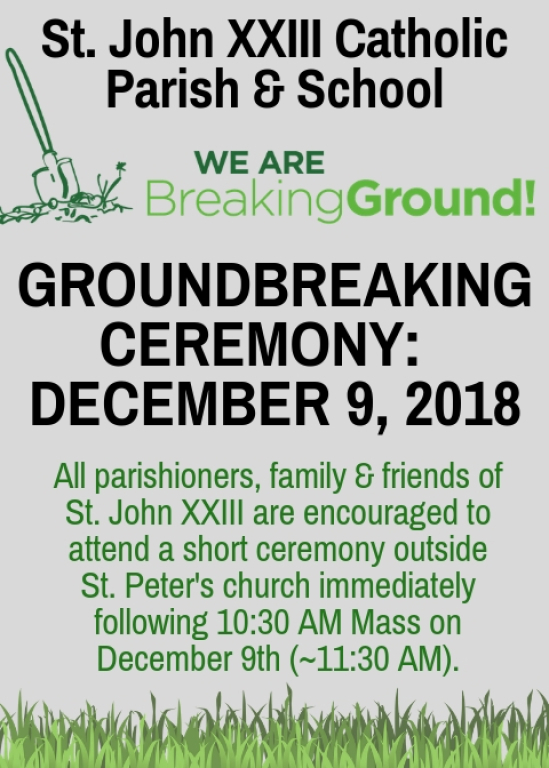 This participation reflects the excitement and hopefulness that parishioners have towards this opportunity to ensure that our parish is a center of spiritual growth and renewal for generations to come. Thank you to the many volunteers who were trained this past week to serve as telephone callers. These volunteers will be making phone calls in the week ahead. These telephone calls are not solicitations, but rather, an opportunity for you to ask any questions you may have… and to be made aware of upcoming Appeal dates. Save the Date! Next weekend we will be sharing more about our Gather & Grow Appeal. We call this “Invitation to Share” weekend. Join us for Masses on this special weekend, where we will pray for God’s blessings on our plans for the future, and share more information about the Appeal. All parishioners are receiving in the mail an Appeal packet containing additional information and a form for your three-year Capital Fund response. We will then ask you to spend the next couple weeks praying and considering how God is leading you to respond to this Appeal. St. John XXIII Catholic Parish has been blessed by the faithfulness and generosity of its parishioners over many years. Our Gather & Grow Appeal is our opportunity to build upon those blessings. Our Appeal now reaches out to the entire parish to raise funds needed to ensure that our parish is a center of spiritual growth and renewal for generations to come. Our Appeal also serves as our annual stewardship invitation to every parishioner to make a financial commitment in support of the ministries, programs, and services we offer to help us grow in faith. All parishioners are receiving in the mail an Appeal packet containing additional information and a form for your three-year Capital Fund response. Save the Dates! We will be sharing more about our Gather & Grow Appeal at our regularly scheduled Masses on October 21 & 22. Please plan on being with us on this special weekend. Then, on the weekend of November 4 & 5, we will be asking everyone to return their Appeal response at the regularly scheduled Masses. With a heart full of gratitude to God and each one of you, I would like to share the precious gift I have been given in receiving a Catholic education at Port Catholic School and in growing up within our parish community. The graces and impact of these gifts continue to unfold as I grow in my relationship with the Lord and take steps in my vocation with the Franciscan Sisters of the Renewal. Some of the first seeds of faith were planted and nourished during my time at Port Catholic School, including the seeds of a relationship with Jesus and of my vocation. It takes soil rich in the nutrients of love and faith to nurture those seeds and help them to grow. This was exactly the kind of environment I found at Port Catholic and within our parish community. I would like to share a bit about the seeds that were planted and the abundant fruit I am already experiencing. The seeds of my relationship with Jesus remind me of a homily Fr. Al gave at a school Mass during Advent. I was in second or third grade, and he encouraged us to wake up Christmas morning and before we did anything else, to go to the Nativity in our house and sing “Happy Birthday” to Jesus. Christmas morning came, I woke up and remembering the homily, I sat down on the living room carpet right next to Jesus in the little manger and quietly sang “Happy Birthday” to Him. My heart was filled with a quiet joy and peace. As I look back on that grace, I realized that it was a beautiful moment of prayer and of opening my heart to Jesus. Although I might not have been able to articulate it at the time, Father was teaching us that Jesus is to be the center of our lives and of our hearts, not just on Christmas day but every day. The experience of going to school Mass each week and with my family led me to decide to go to Mass as a freshman in college. I received a particular peace and consolation during those Sunday Masses and started going more often until soon I was going to Mass every day. My relationship with Jesus was going deeper. Seeds of my vocation were also planted during my days at Port Catholic. One day in second grade, Sr. Margie Ann took us next door to see where she lived. My favorite part was when she showed us her chapel. I was delighted to see that Sister had her own little “church” where she could be with Jesus. I didn’t immediately sense a call from the Lord to religious life and to belong entirely to Him, but Sr. Margie Ann’s life made me aware of religious vocations in the Church, and my heart began to stir. These seeds that were planted have been nourished with the love of God within our parish community and Port Catholic School. I am ever grateful for the abundant graces I have received and that have led me to discern my vocation. I thank you for your prayers and support that I have felt along the way. Please join me in giving thanks to God for the gift of Catholic education and respond with whole hearted support for St. John XXIII Catholic Parish & School. Your gifts of Talents, Skills, and Time are appreciated! As parishioners generously respond with financial gifts to our Gather & Grow Appeal, we are aware that some parishioners may be in a position to offer their skills, talents, time, and other in-kind gifts to the Appeal. You may have access to building construction skills, materials, or products which you are willing to offer, thereby saving the parish significant costs. Areas of potential need may include carpentry, concrete, drywall, plumbing, electrical, roofing, flooring, painting, HVAC, insulation, landscaping, or site prep. We are seeking the names and addresses of friends of our parish you believe would be interested in knowing about our Gather & Grow Appeal. Our friends may include former members who have moved away, grown children, relatives of present members, community members, etc. We wish to provide all our friends an opportunity to participate in our Appeal. Please provide their names and addresses to Deacon Mike Burch in our parish office at (262) 284-4266 or email Mike at burchm@stjohn23rd.org. We will mail an Appeal packet from the office or we can provide the packet to you if you wish to include a personal note. 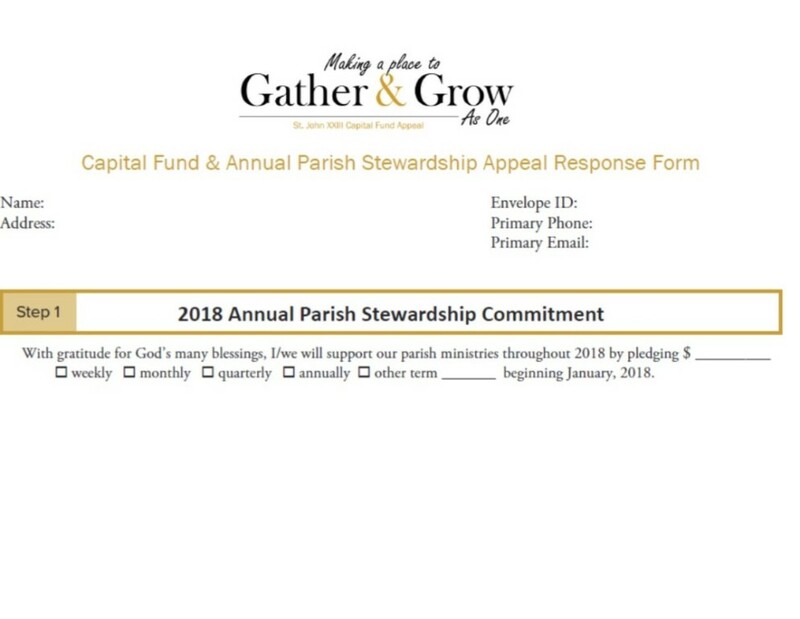 Check out the Annual Parish Stewardship commitment form! The estimated cost of our building project is roughly $4.5 million. Through our Gather & Grow Appeal, we now strive to raise as much of this amount as possible. How can we do it? As always, we’ll take this journey together with generous and grateful hearts. We will need special gifts over the next three years from all our parishioners, over and above our current regular contributions. In December, after the Appeal commitments are received, we will know the total project funds we can expect from our parishioners over the next three years. We will then factor in our other funding sources and finalize our building project plans with affordability in mind. 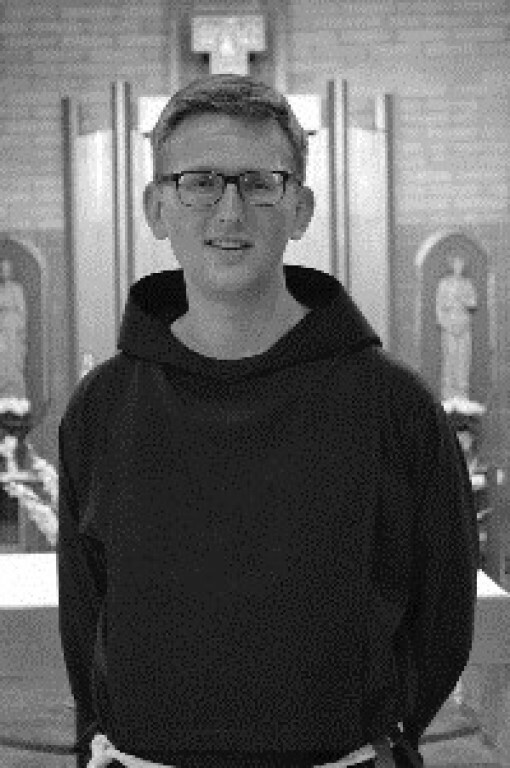 A special message from Capuchin Brother Joe Babcock. Wow! It's so exciting to hear about the proposed building project. I would love to see new energy at St. John XXIII...the faith formation programs are so vital. My calling to religious life was fostered at St. John XXIII. The first ideas I had about priesthood or religious life were formed as I attended school from kindergarten to eighth grade at Port Catholic. I remember asking my second-grade teacher, Sister Margie Ann, "What's a brother?" Though this question faded into the background for a long time, my Catholic education helped to keep faith in my vision of life. In high school, I entered the confirmation program and continued my faith formation at the parish. I was able to know Fr. Pat and Fr. Tom and understand better what the priesthood entails. Perhaps most importantly, I was able to come to church after the school day and participate in the parish's Eucharistic Adoration when I started asking the big questions and began discerning what I was being called to make of my life. The figure that really drew me deeper into my faith life was Saint Francis of Assisi. His legacy is a story of a rich, aspiring young man who left everything he had once he found the one thing he needed: Jesus Christ. After reading about Saint Francis's radical conversion and his embrace of a poor life based totally on the Gospels, I sensed that there was a real challenge available to me. Was I going to continue down the path which I had carved out in life, or was I going to live as the Truth which I had encountered demanded of me? I began to approach my life with a new sense of freedom. From various encounters with the friars and with the poor that they minister with, I discerned that this was the place where I was called to go. In taking this risk, I have had no regrets! So too I hope that in the revitalization of our parish community we may all have the freedom to give joyfully of the gifts that we have received from the same generous Father. St. John XXIII Catholic Parish has been blessed by the faithfulness and generosity of its parishioners over many years.Our Gather & Grow Appeal is our opportunity to build upon those blessings.Our Appeal now reaches out to the entire parish to raise funds needed to ensure that our parish is a center of spiritual growth and renewal for generations to come. Our Appeal also serves as our annual stewardship invitation to every parishioner to make a financial commitment in support of the ministries, programs, and services we offer to help us grow in faith. Information Sessions to Share the Current Building Plans. Next weekend, after each Mass, there will be 30-minute information sessions to walk-through the revised conceptual renovation plans. Please plan on joining us. There will also be an information session on Tuesday evening, September 12, at 6:30 pm at the St. Peter’s cafeteria. Parishioner input from past sessions was very helpful in shaping the current plans.The plans that are shared will continue to evolve as additional input is received. Thank you for your participation! In the months ahead, our Gather & Grow Appeal will reach out to the entire parish to raise funds needed to ensure that our parish is a center of spiritual growth and renewal for generations to come. We experience Christ in our lives through relationships built with one another. Our parish events and social activities help build relationships, drawing us together as a family of faith. The renovations will enhance those relationships of parishioners and others in the Port Washington and Saukville communities by providing facilities in one location for activities including, but not limited to, various parish committees, funeral hospitality, Men’s Club, Catholics Women’s Society, Boy Scouts and Girls Scouts programs, Knights of Columbus, fish fries, spaghetti dinners, Christmas programs, and sporting events. The entire community will benefit from the addition of a full elevator providing access to both levels of our facility, and enhanced security systems. Stay tuned! In response to all the good feedback we received from parishioners, revised conceptual building plans will be shared with everyone after Labor Day. Education is vital as we grow in Christ. Everyone, from our pre-school children to our most senior parishioners, are called to grow in our understanding of our Catholic Faith and the living out of our Gospel values. 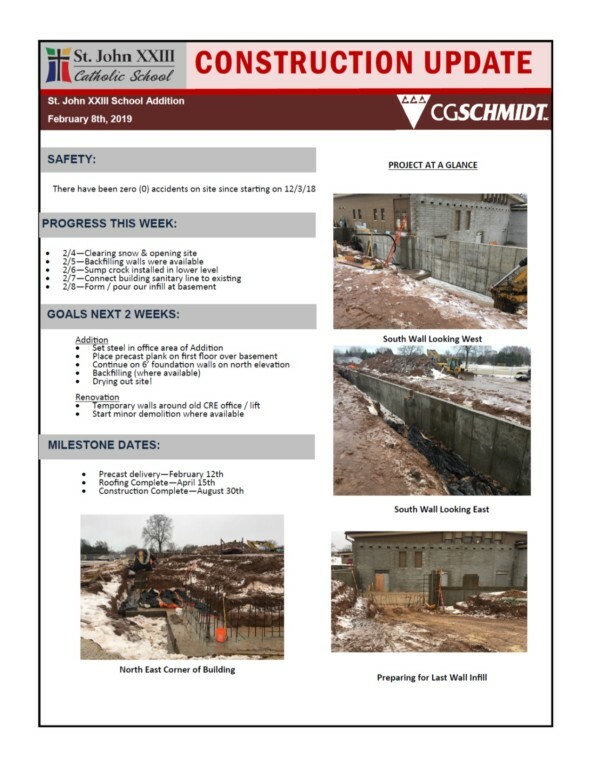 The proposed renovation project will greatly enhance our learning environment and improve the quality of our educational offerings to all ages. The renovations will provide the spaces needed to consolidate our Child Ministry and Youth Ministry Programs in one location. These ministries serve more than 360 children and youth, including the Mustard Seed program (young pre-school), elementary CRE (K4 through 6th grades), middle school (7th and 8th grades), high school (9th through 11th grades), as well as sacramental preparation and family programs. Our mission is to provide a child-centered, faith-filled learning community where Catholic values are lived and taught. Our commitment to academic excellence promotes student success. Every child is nurtured, challenged, and known as an individual. Our entire school community is committed to providing the finest Catholic education possible for our students. While preparing students for higher education and life beyond college, we create a community where service, excellence, discipleship, and community are part of our everyday life. The renovations will benefit our Catholic School which serves approximately 200 students. New and renovated classrooms will allow us to bring all students and staﬀ together in one building. The middle school will be in its own wing, separated from the younger grades. A classroom will be dedicated to the STEAM lab (Science, Technology, Engineering, Arts and Mathematics). Our focus throughout is on Christ. As a parish, we strive to gather and grow in Christ. As one faith community, we seek to encounter Christ, be transformed by Christ, and accept Christ’s mission to spread the Gospel throughout Port Washington and Saukville. Our parish is blessed to have three wonderful worship sites. As in past generations through today, our church buildings will continue to serve us into the future as the sacred places where we Gather & Grow in faith. The success of our Gather & Grow appeal will help secure that future, by seizing the opportunity to operate more efficiently and reduce costs by consolidating many parish and school functions. Facilities no longer needed and costly to operate are currently in the process of being sold. We honor the faith, commitment, and generosity of all the faithful who sustained and nurtured the parishes of St. Mary, Immaculate Conception, and St. of Alcantara. Now, as one community of faith under the protection of Saint John XXIII, we carry forward the torch of faith that has been passed on to us. Emboldened by the Holy Spirit, we now unite as one to provide the parish facilities needed to gather and grow in Christ for generations to come. St. John XXIII Catholic Parish has been blessed by the faithfulness and generosity of its parishioners over many years. Our Gather & Grow Appeal is our opportunity to build upon those blessings. Our Appeal reaches out to the entire parish to raise funds needed to ensure that our parish is a center of spiritual growth and renewal for generations to come. Our Appeal will also serve as our annual stewardship invitation to every parishioner to make a financial commitment in support of the ministries, programs, and services we offer to help us grow in faith. Stay tuned! In the weeks ahead, you will be receiving more information about our Gather & Grow Appeal. In response to all the good feedback we received from parishioners, the architects continue to develop the next version of our conceptual building plans. These plans will be shared with everyone after Labor Day. We have a tremendous Appeal Team in place. More volunteers are currently being enlisted. You may receive a phone call asking you to help out. Please be open to this invitation. Don’t worry… you do not have to ask for money! The appeal is organized so that the activity is distributed among many people. Each person does just a little work. We are confident you will enjoy this experience.